In a multi-view orthographic projection, a NORMAL line is one that is parallel to two of the planes of projection and perpendicular to the third. A line that is parallel to a plane of projection will appear on that plane in its true length (to the scale of the drawing). A line that is perpendicular to a plane of projection will appear on that plane as a point. A line that is perpendicular to one plane of projection must of necessity be parallel to the other two. But a line that is parallel to one plane of projection may be oblique (neither parallel nor perpendicular) to one or both of the others. A line that is oblique to one or more of the planes of projection is called a NON-NORMAL LINE. If a non-normal line is parallel to a plane of projection, it will appear on that plane in its true length. However, it will appear foreshortened in a view on a plane to which it is oblique. A non-normal line may, of course, be oblique to all three planes of projection, in which case it will appear foreshortened in all regular views of the object. 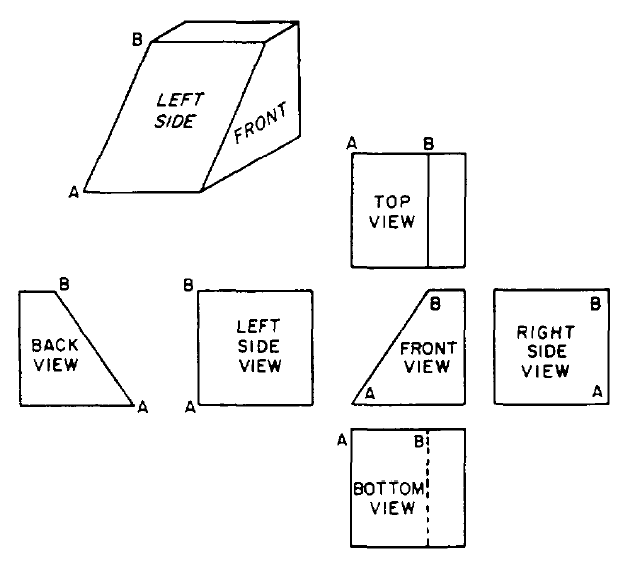 A REGULAR VIEW is a view on one of the three regular planes of projection (horizontal, vertical, or profile). Views on planes other than the regular planes are called AUXILIARY VIEWS. Auxiliary views will be discussed later in this chapter. A single-view projection of a block is shown in the upper left corner of figure 5-20. 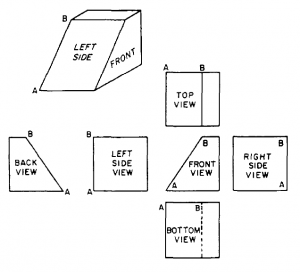 This block is presumed to be placed for multi-view projection with the front parallel to the vertical plane, the bottom parallel to the horizontal plane, and the right side parallel to the profile plane. The line AB, then, is parallel to the vertical plane, but oblique to both the horizontal and the profile planes. In the multi-view projections, you can see that it is only in the views on the vertical plane (the front and back views) that the line AB appears in its true length. In the views on the horizontal plane (top and bottom views) and in the views on the profile plane (right and left side views), the line appears foreshortened. Note, however, that you don’t need to calculate the amount of the foreshortening, since it works itself out as you project the various views.